This cute box is like a collapsible cat bed, giving your kitty the compression therapy they love in a design that far outwits the tattered shoebox. It’s designed to fold and store, and the durable nylon is extra easy to clean. 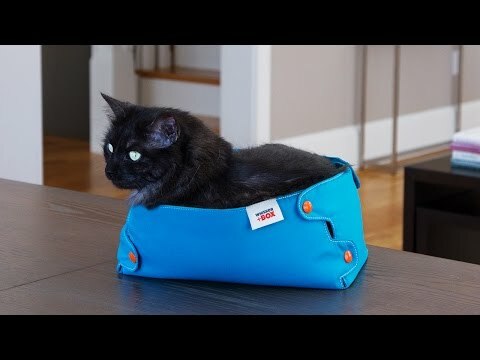 Cats love squeezing into these, and you’ll love supporting something Made in the USA. Dimensions: Snapped: 12.5" x 7.5" x 5.5"; Flat: 22.5" x 18" x 0.25"
My cat loves this box! My boyfriend was skeptical when I gave his cat this for Christmas-it’s just another box right? But his cat LOVES IT! Good job Grommet. You’ll love watching your kitty squeeze and bask in something attractive, sturdy, and American made.